The lives of two young women—bound by heritage and history—are changed forever by one epic event . . .
1889: Elizabeth Haberlin, of the Pittsburgh Haberlins, spends every summer with her family on a beautiful lake in an exclusive club. Nestled in the Allegheny Mountains above the working-class community of Johnstown, Pennsylvania, the private retreat is patronized by society’s elite. Elizabeth summers with Carnegies, Mellons, and Fricks, following the rigid etiquette of her class. But Elizabeth is blessed (or cursed) with a mind of her own. Case in point: her friendship with Eugene Eggar, a Johnstown steel mill worker. And when Elizabeth discovers that the club’s poorly maintained dam is about to burst and send 20 million tons of water careening down the mountain, she risks all to warn Eugene and the townspeople in the lake’s deadly shadow. Present day: On her eighteenth birthday, genetic information from Lee Parker’s closed adoption is unlocked. 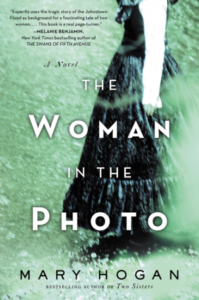 She also sees an old photograph of a biological relative—a nineteenth-century woman with hair and eyes likes hers—standing in a pile of rubble from an ecological disaster next to none other than Clara Barton, the founder of the American Red Cross. Determined to identify the woman in the photo and unearth the mystery of that captured moment, Lee digs into history. Her journey takes her from her hometown in California to Johnstown, from her present financial woes to her past of privilege, from the daily grind to an epic disaster. But once Lee’s heroic DNA is revealed, will she decide to forge a new fate? Mary Hogan is the NAPPA Award-winning author of seven young-adult books. Two Sisters is her first novel for adults. She lives in New York City with her husband, Bob, and their dog, Lucy. 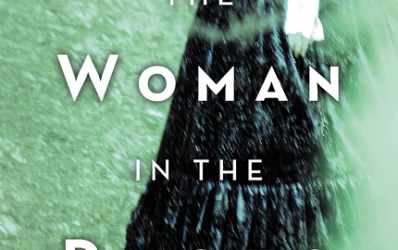 I began reading The Woman in the Photo thinking I would prefer the historical chapters more than the contemporary ones, and was surprised when I found that not to be true. Instead, I liked both time periods equally. In the past, we meet Elizabeth Haberlin, aged twenty, on a seemingly interminable train ride to her family’s summer home. But the train eventually does roll into the stop, and Elizabeth (or Lizbeth, as her eight-year-old brother calls her) is reunited with her friend, Eugene Eggar, a townie – a mill worker. In the present, we meet Lee (named Elizabeth at birth, but adopted as a baby), newly turned eighteen, and living with her mother in someone’s pool house because of familial financial woes. She’s just been provided with a clue about her birth mother – a faint clue – but a clue nevertheless. I loved the way author Mary Hogan wove these two tales together, the chapters in the past driving relentlessly forward, the chapters in the present looking backward. Almost, it made me wish for a magic mirror so that Lizbeth and Lee could come face to face, but maybe, metaphysically, they did, because while this book is about influences of Destiny and DNA, it’s also about choices and family, and what constitutes the latter. Ultimately, I really enjoyed this novel as a whole, and took it not only as a sort of family saga, but also as a portrait of the many ways in which young women make the decisions that set the paths of their lives. And what a rich portrait it is, with believable, complex characters, vivid settings, and just enough real history to lend credence to the story without overwhelming it, or sounding more like a history book and less like a work of fiction. Readers of historical fiction and contemporary fiction will find something to like in The Woman in the Photo. Goes well with roasted, herbed chicken, a tossed salad, and iced tea.